Twinkling Stars shimmer with your every move…..Designed in 14 Karat white gold, 0.03 Carat t.w. 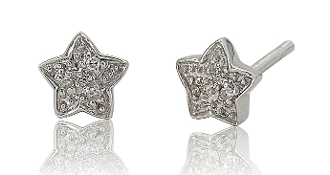 round cut Diamonds bring these petite star-shaped studs come alive. These starry stud earrings secure with butterfly push backs, and are a perfect gift for your little girl! Carat Total Weight (c t.w) refers to the total weight of all diamonds set in the jewelry item. For example, in order to calculate the ct. t.w. of a three stone ring, one would take into consideration the center diamond as well as the two side stones.